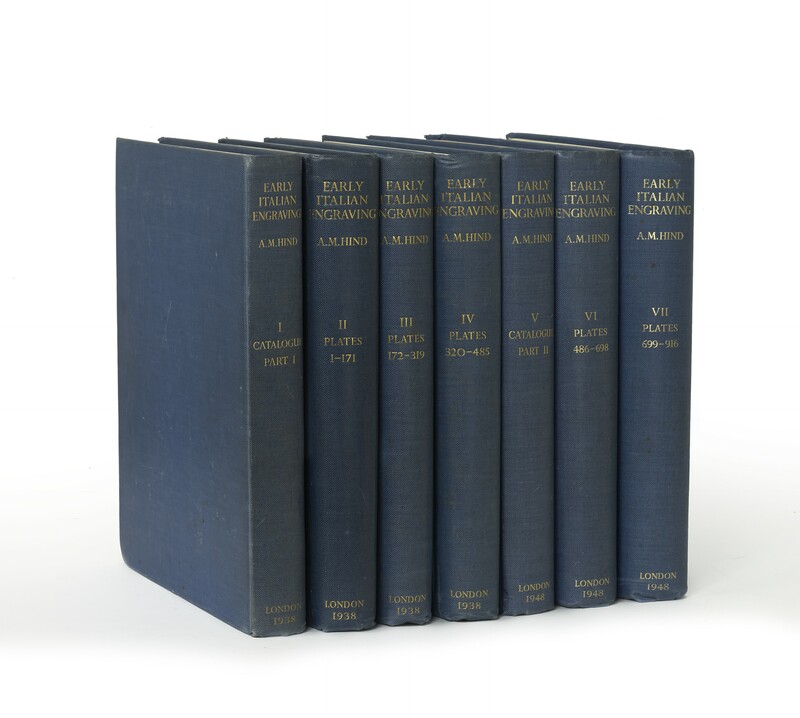 Two parts in seven volumes (34 cm), I (Catalogue, Part I, 1938): xxvi (2), 345 (1) pp., frontispiece. Copy 93 (of 375). II (Plates, 1938): (8) pp., plates 1-171. Copy 93 (of 375). III (Plates, 1938): (8) pp., plates 172-319. Copy 93 (of 375). IV (Plates, 1938): (8) pp., plates 320-485. Copy 93 (of 375). V (Catalogue, Part II, 1948): xxii, 347 (1) pp., frontispiece. Copy 99 (of 275). VI (Plates 1948): (8) pp., plates 486-698. Copy 178 (of 275). VII (Plates, 1948): (8) pp., plates 699-916. Copy 251 (of 275). Uniform publisher’s blue buckram. 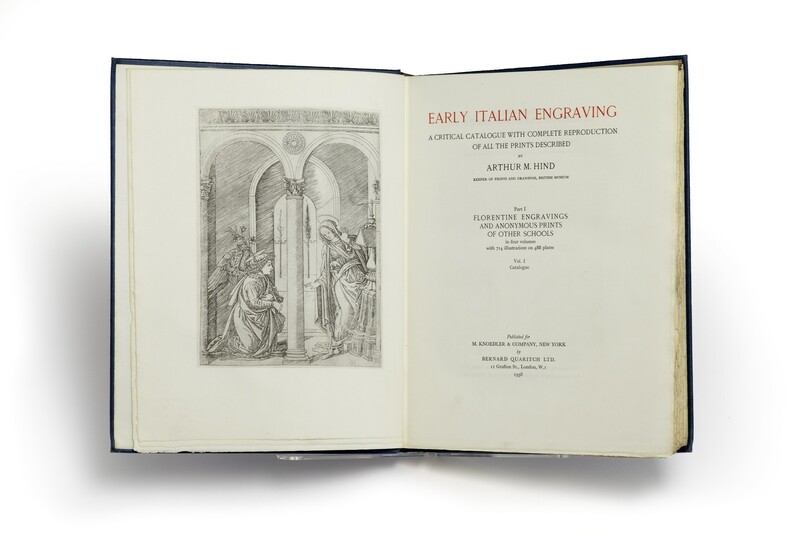 - The core of this monumental work is Hind’s study of the collection of early Italian engravings in the British Museum. The first part (vols. 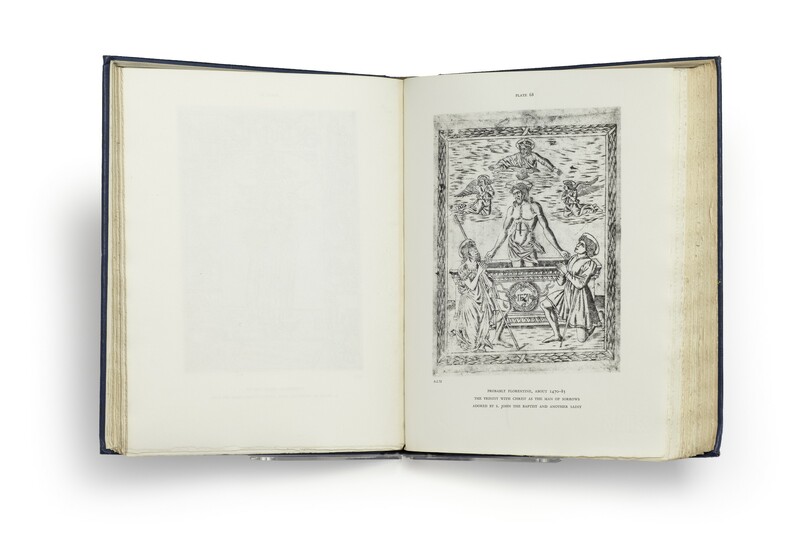 I-IV) is devoted to “Florentine engravings and Anonymous prints of other Schools” (catalogue and 714 illustrations on 488 plates) and the second part (vols. V-VII) to “Known Masters other than Florentine”, Monogrammists, and Anonymous Masters (catalogue and 692 illustrations on 431 plates). Biographical and bibliographical information on each artist is followed by a list of his works. The edition was limited to 375 copies (vols. 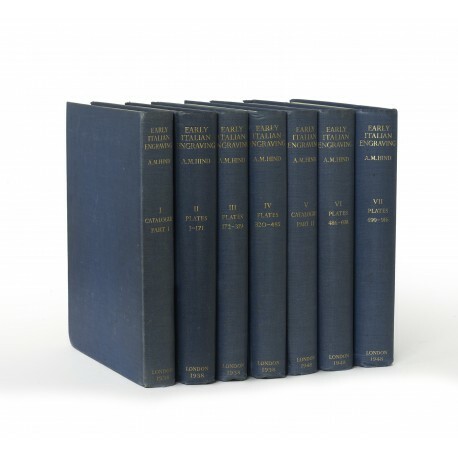 I-IV) or 275 copies (vols. V-VII); both text volumes are inscribed by the author, as usual. The author presented his manuscript to Lessing Rosenwald in 1948 (now Library of Congress, Rosenwald Collection, NE659.H.48). 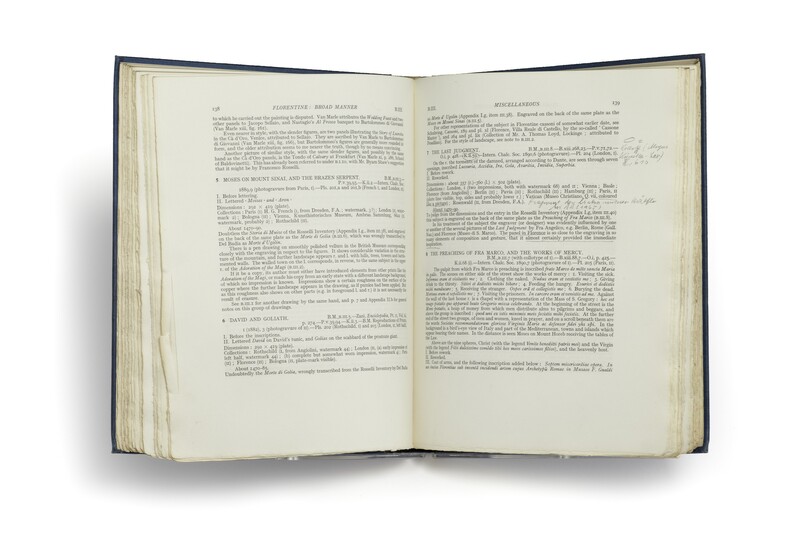 ¶ From the auction sale of the Handbibliothek L’Art Ancien, Zürich (Auktion 3/I), conducted by F. Zisska & R. Kistner, Munich, 27-28 March 1984, lot 671. Occasional pencil annotations by the proprietor of the firm, Erwin Rosenthal (1889-1981). Excellent set.